Zazzle is a great website for creating personalized items such as mugs, t-shirts, buttons and stickers. I've previously used them with my Nailkita Brand, and have now moved everything over to my KilianWalkerDesign brand. Illustrations used in my Zazzle Store may be similar in style to my stock illustrations, but I will try to be more fun with them, to create original gift ideas you can mix and match. 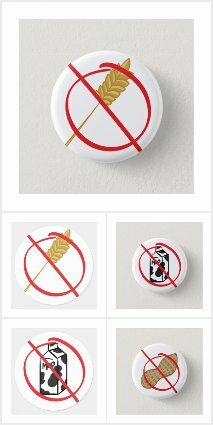 I also have up a collection of alert-like stickers and buttons for products, or for children to wear when suffering from a severe allergy.